Founded by renowned personal injury and medical malpractice attorneys Richard Godosky and Anthony P. Gentile — the goal underlying our firm's practice has always been to give each client the best of both worlds: The experience level and capabilities of a large firm, along with the kind of personal attention and accessibility that only a smaller practice can offer. Today, with nine attorneys, a professional support staff that includes paralegals and a full-time investigator — we are proud to have achieved our goals of offering both results and personal service to our clients and we look forward to continuing these efforts in the coming years and decades. Regardless of whether the matter involves car accidents, nursing home negligence, wrongful death or a business-related dispute, our method and approach is simple and direct: Pay attention to detail and meticulously prepare every case to win at trial. To ensure that each client's case receives the attention it deserves, and that there is always an attorney with knowledge of the case available to answer questions and address client concerns, our firm is committed to a team-based approach. This, in turn, helps clients feel more comfortable with the process, remain informed and therefore better able to assist our lawyers in the preparation of their case. Having used this approach successfully for decades, we have had some of the largest settlements and verdict awards in New York State's history. Our reputation also serves to maximize the settlement offers extended to our clients by defendants. Our cases include a variety of general negligence matters like serious automobile accidents, construction site accidents and incidents of medical malpractice. We have also been one of the firms representing members of the New York City Fire Department for numerous injuries arising out of the September 11th attacks and their aftermath. 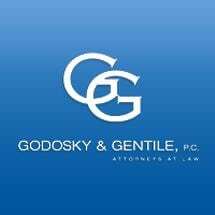 In addition to personal injury, attorneys at Godosky & Gentile handle a variety of civil and commercial disputes for clients that range from real estate developers and independent fiduciaries to regional businesses and Fortune 500 companies. In addition to the referrals our law firm receives, lawyers and judges throughout the state turn to Godosky & Gentile when they themselves need legal representation. Regularly retained by attorneys and judges who face disciplinary actions by the Departmental Disciplinary Committees and the Commission on Judicial Conduct —Richard Godosky has represented dozens of judges and attorneys in this capacity and is widely viewed as a preeminent authority in matters of Professional Responsibility, Ethics and Disciplinary actions.